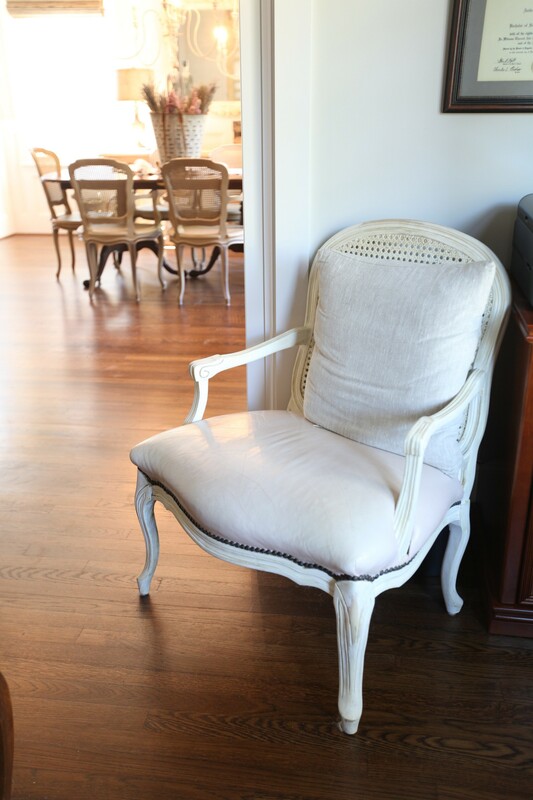 I think you might have seen my leather French chairs before, but I don’t think I shared my before photo with you. These chairs are great for visitors. Big enough to be comfortable, and the leather seats are easy to clean. Not only are these French chairs gorgeous, but I got them for a fabulous price. How did I do that? I found them at a consignment store for a very reasonable price. The wood was that blonde color, so I knew the chairs wouldn’t work as is. 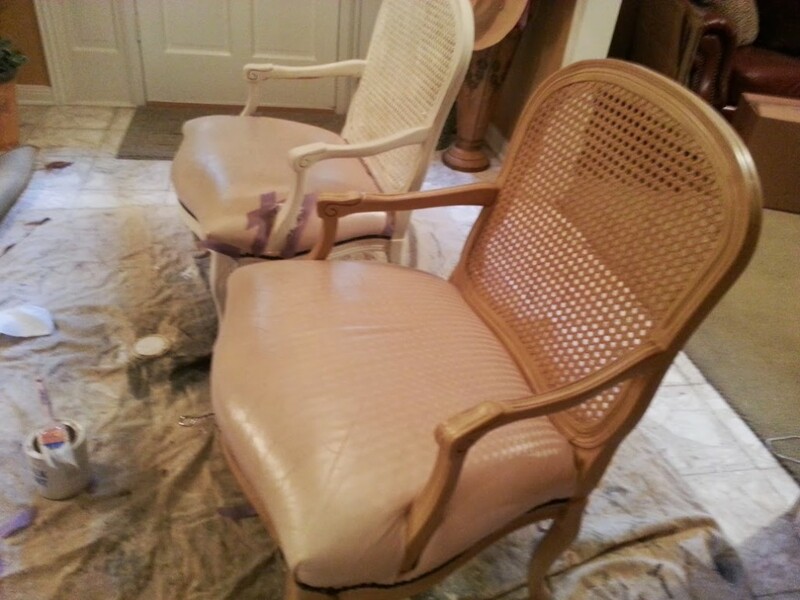 I taped off the leather seat and used chalk paint to paint the wood and caning. The seat color is champagne, doesn’t that sound yummy? I just like for you to see that French furniture doesn’t have to be expensive. These are vintage chairs and are very sturdy. I am pretty certain I paid less than half of the original price. Have you gotten a great deal lately? Want to see more of my study? You can see it here and here. Great chairs- they’re’re perfect for your new home. Painting them really gave them the perfect update! I haven’t been thrifting in a while, so I haven’t found any great deals. I love your score though! Beautiful chairs, I love that you updated them to work in your home. Beautiful chairs Anita!!! And I love what you’ve done with them…they look perfect in your home! Beautiful chairs! I love the new color and the leather seats are the best. Anita, what a beautiful find! I love the white pained chair with the champagne… You are right YUMMY! 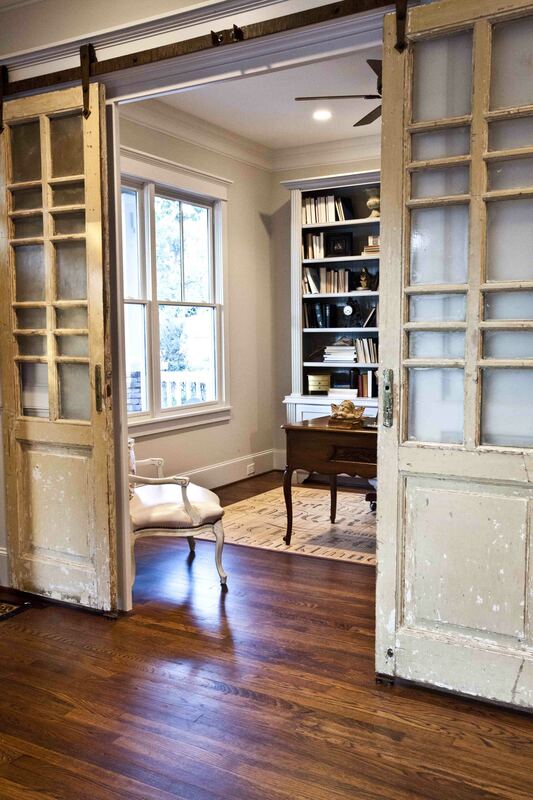 I adore the library doors! All is so beautiful at Cedar Hill Farmhouse! 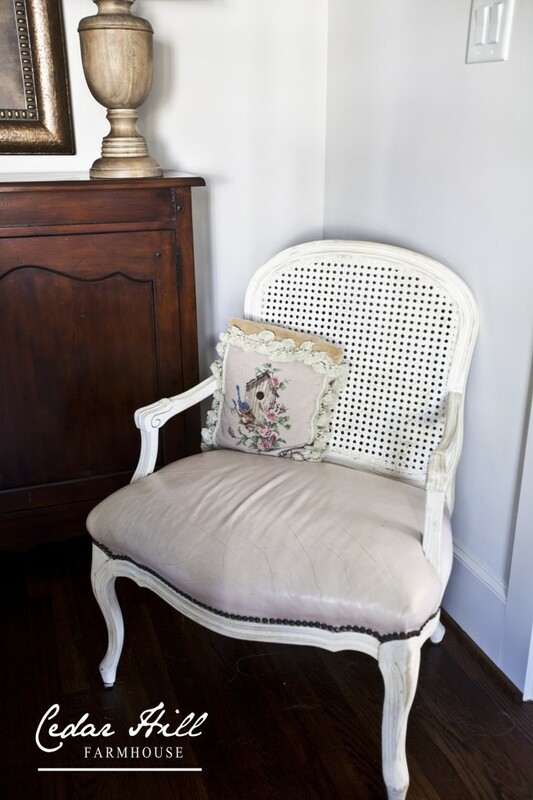 Gorgeous chairs and I love the new paint color…what a great find..
Beautiful! You are so creative! I love seeing how you transform the mundane into something spectacular. Wonderful job on the chairs. Merry Christmas! Yes, about six months ago a neighbor was having a sale and we got two Ethan Allen French chairs for $20 each. We have since decided to recover them, but what a deal! Anita these are gorgeous. I wish we had good thrift stores around us but they have all junk. Every time I see those doors of yours I drool. I love that you painted the chairs!!! Yes!!! I have a chair make~over in progress. I found a great narrow bookcase recently at a thrift shop. The chairs are absolutely beautiful! Sometimes I have to go a few times to find a great deal but I love the hunt. Well done Anita, Great job!! !